At Lunsford McCaffrey Orthodontics, we believe everyone deserves a beautiful, healthy smile they're proud to show off, and our mission is to help our patients achieve one through quality orthodontic treatment. While most of our patients are teenagers getting braces for the first time or adults receiving orthodontic treatment, we're proud to treat patients of all ages at our West Palm Beach orthodontic practice, and sometimes that means starting treatment early. There are a number of orthodontic conditions and problems that can benefit from interceptive orthodontics, and if your child needs early treatment, we can help. Diagnoses of Attention Deficit Hyperactivity Disorder (ADHD) have been on the rise for at least a decade. But according to a recent study, attention problems like these often aren't caused by an underlying disorder: in many cases, they're caused by a sleep-related breathing disorder (SRBD), like sleep apnea. The study was published in the journal Pediatrics in 2012, and it followed more than 11,000 children from the time they were six months old to 6 and a half years old. Compared to children without sleep problems, children with an SRBD were 40% to 100% to develop behavioral problems that resembled ADHD. This means that often, even if your child exhibits the symptoms of ADHD, the problem may not be a mental disorder: it may simply be that your child isn't getting healthy sleep. This is because lack of sleep can affect children differently than it affects adults. While sleep deprivation usually makes adults tired and sluggish, it can make children more hyperactive and unable to focus, similar to the symptoms of ADHD. Thankfully, we can provide convenient orthodontic treatments to correct SRBDs and help your child get back to their normal self. Obstructive Sleep Apnea is a sleep condition where the soft tissues at the back of the throat, including the tonsils, tongue, or soft palate, collapse during sleep, blocking the airway and interrupting breathing. An individual episode of interrupted breathing is called an apnea, and it will normally cause the brain to wake up the body enough to reopen the airway and resume breathing. The tricky part is that often, the brain doesn't wake up enough for someone to remember the incident, so they have no knowledge of the apnea – but it does interrupt healthy sleep. Extreme cases of sleep apnea can cause apneas to occur up to 60 times per hour, which can rob the sufferer of restful sleep. CPAP: Continuous Positive Airway Pressure machines use a mask to deliver mild air pressure during sleep, helping to prop the airway open. Surgery: In some cases, we may opt to surgically remove enlarged tonsils or adenoids. Palatal Expansion: Sometimes using a palatal expander, which can painlessly widen the jaw, can provide relief from sleep apnea. OSA Mouthguards: We can also fit your child with a mouthguard that repositions the lower jaw to prevent the airway from closing. Every child is different, and our West Palm Beach orthodontist will work with your child to decide on the best treatment for their unique case. But no matter which treatment we recommend, the most important step is to start the process as soon as possible – so if you feel your child may suffer from sleep apnea, reach out to us today. 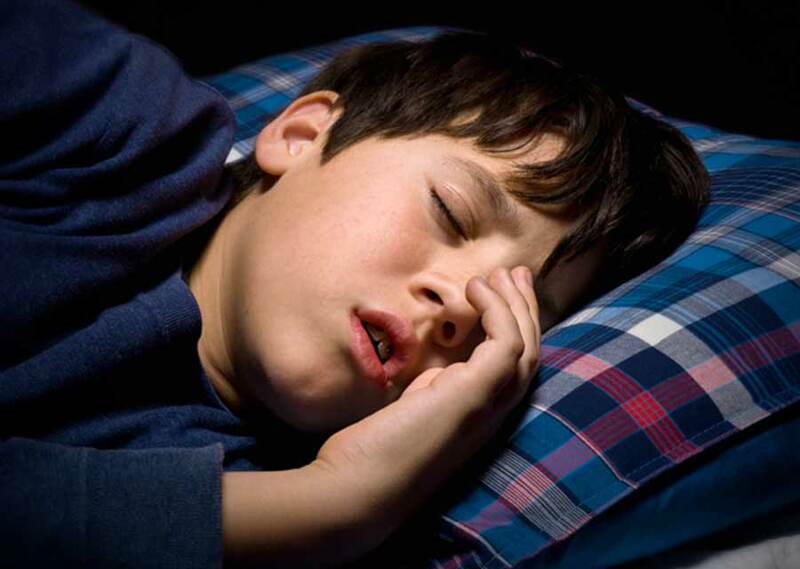 While sleep apnea can be a serious problem, it's not the only reason a child may need early orthodontic treatment. For certain orthodontic malocclusions, the best options for achieving a healthy smile is to start with early orthodontic treatment. And more often than not, our West Palm Beach orthodontists will recommend treatment with a palatal expander in these cases. Palatal expanders are designed to take advantage of a child's natural growth processes to alleviate orthodontic conditions, helping us provide convenient treatment for conditions that would otherwise require extensive treatment like surgery to treat later in life. Expanders work by creating more space for teeth by widening the upper jaw – a process that, while it may sound unsettling, is remarkably easy and convenient. During childhood, the left and right halves of the upper jaw are still separate bones and won't join together until adolescence. An expander works by applying a light outward force to each half, influencing them to slowly drift apart and stimulate more bone growth in the middle. Over time, this literally widens the upper jaw, creating more space in the dental arch and solving a number of orthodontic problems. Crowding: Crowding occurs when there isn't enough space in the dental arch to accommodate all the teeth. 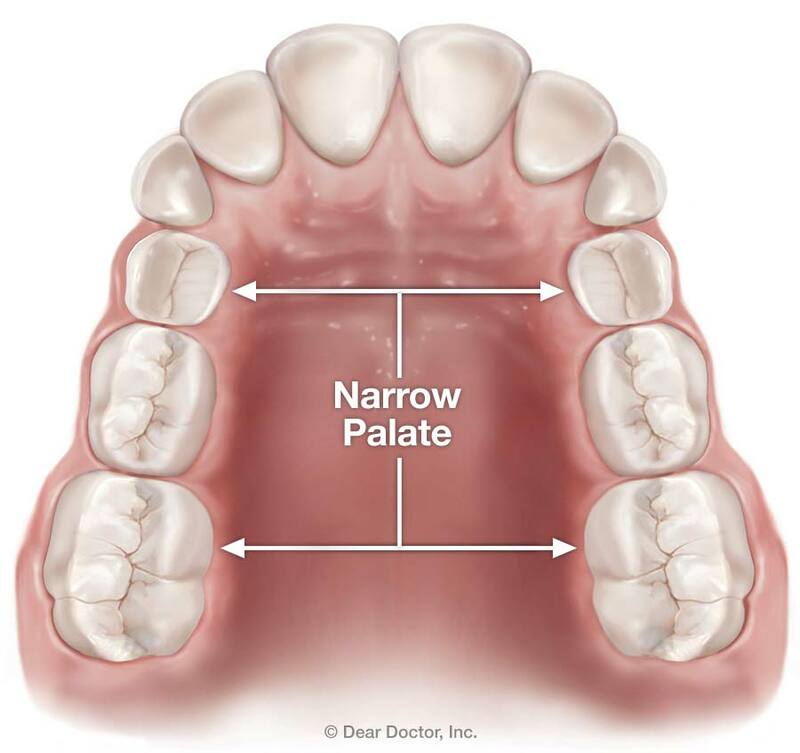 Palatal expansion creates more room in the jaw and dental arch, giving teeth space to grow in correctly. Impacted Teeth: Tooth impaction occurs when a tooth can't erupt correctly because it's blocked by other teeth. Expansion lets us create enough space for the teeth to grow in straight and free any impacted teeth. Crossbite: Crossbite occurs when the lower back teeth close outside of the upper teeth, but by widening the upper jaw through expansion, we can solve this issue. Palatal expanders are essentially a mouthpiece that's custom-made to fit over several of the top teeth in the back of the mouth. The expander has two separate halves with a special screw-activated mechanism in the middle. Using a specially-designed key, you'll turn the screw a small amount each day, which will gradually apply pressure to the two halves to the jaw, influencing them to grow outwards and widening the jaw. After we reach the desired amount of expansion, we'll leave the expander in for a few more months to let the bones fill in the gap in the jaw, solidifying the expansion and cementing your child's new smile in place. While treatment varies based on your child's specific condition, the expansion process usually takes 3-6 months in total. As with all orthodontic appliances, your child will likely experience some soreness for the first few minutes after turning the key and increasing the expansion – but this is usually mild and doesn't last long. Speaking and eating may be slightly difficult immediately after getting the expander, but as the tongue adjusts over the course of the next week, these problems should fade away. It's also normal for a gap to form between the front teeth as the expansion process unfolds, but have no fear: this merely tells us that the treatment is working, and when all is said and done, your child will have a beautiful smile thanks to the expansion treatment. 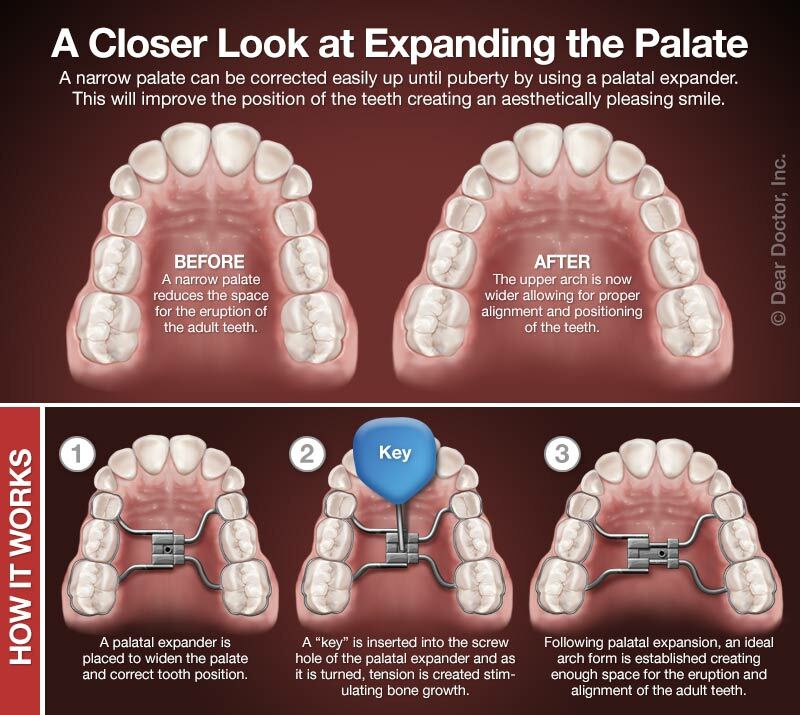 All in all, palatal expansion is a simple, effective treatment that causes almost no discomfort and helps to prevent costly and uncomfortable treatments later on. While not all children need early or interceptive orthodontics, they can make a dramatic difference on your child's smile and quality of life if they're needed. Contact us today to learn more about our early orthodontic treatments and schedule a consultation to see if they're right for your child. We can't wait to hear from you, and we look forward to helping your child achieve a beautiful, healthy smile in the long run!